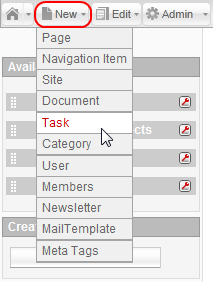 By assigning new tasks you can organize and structure the workflow inside AxCMS.net. To assign a new task, go to New -> Task OR Edit -> Tasks and press the New button in the New section on the left side of the page. Saves the current task. You are taken to the task overview page. Saves the current task. You remain on the task detail page. Takes you back to the previous page (task overview page). No changes are saved. Opens the task detail page for creating a new task. Description (name) of the task. Textbox for elaborating the task`s purpose. 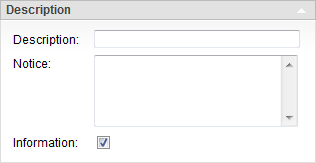 Checking this checkbox and saving the task makes the aimed user receive an email about the task. The description will be displayed as the subject; the notice will be shown in the body of the email. Additionally, the author of the task is displayed. 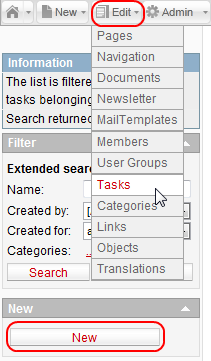 Here you can assign categories to your task. Name of the task's author (the user who is logged in) is automatically shown here. You can select a user of AxCMS.net as recipient of the task from the dropdown menu. Here you can define the due date for the task. Clicking on the calendar icon makes a small calendar pop up, there you can select a due date for the new task. This date will also be displayed in the email that the recipient of the task gets.